ADA Compliant The Americans with Disabilities Act (ADA) recognizes this appliance as compliant for use in homes for those with disabilities. Timeless designs. Styles unlike anything else. Faucets and fixtures that are livable and enduring. These are just some of the reasons that Moen Incorporated is the number one brand of faucets in North America. But, Moen does more than make faucets. It's also a major supplier of stylish kitchen sinks and innovative bath accessories. Available at AJ Madison. Moen is part of Fortune Brands' Home and Hardware group - a leading consumer brands company that includes leading cabinetry, door and lock manufacturers. 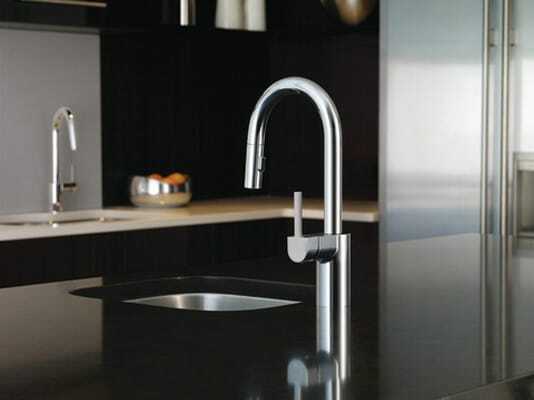 From intimate galley kitchens to large gourmet workstations, Align faucets bring a refreshed modern look to your home. Simple lines create the contemporary style, while a pulldown wand delivers in-demand functionality. High arc spout provides the perfect height and reach for prep sinks while the pulldown feature provides maneuverability for food preparation tasks. Pull-down design offers at-your-fingertips water delivery. One-handle lever handles make it easy to adjust the water. Equipped with the Reflex system for smooth operation, easy movement and secure docking of the pulldown/pullout spray head. Aerated stream for everyday cleaning; powerful rinse for heavy-duty cleaning. Quick connect creates easier, faster installation with fewer tools.